To do something, what i wanted to do for a long time, i read the chapter claiming that mediationism is used like a miracle-tool in different theories. Why i was so hopeful – because there are approaches that deny the perceptional and representational way of making the world meaningful. For example, there is a theory of embodied cognition, where the processing of representations is not needed but they claim that persons directly activate the sensory-motor action paths in brain when being imposed to the sensory-motor action potentialities or affordances in the environment. The book is standing on my table for a while, but the only chapter i have managed to take a look is the intriguing one by Alan Costall. I never saw such a lecture-style in a handbook! His beautiful saying is: ‘making a fetish of mediation’. He describes several approaches how mediationism is used. He uses the metaphor of windowless room to describe the mediationism. We find us over and over again in a room without windows, with pictures hanging on the walls, which depict other windowless rooms. His conclusion is that there are so many ways of getting into this windowless room. He does not want to suggest direct theory of perception or action, but wants to indicate that mediationism seems like a barrier between us and the world. Within cognitive psychology mediationism has taken the form of representationalism. Cognition has long been defined in terms of representations. To deal with situated actions, representationalism gets into trouble because in different contexts the different representations become the second order representations that also involve contexts. The meaning of representations is obtained when they are mapped onto the world. It is believed we need to run internal representations to bridge the gap between the perceiver and the real world. According to the social cognition approach we can only know about other people in an indirect way. Persons’ internal states cannot be observed directly and must be inferred from different cues. Knowing as a representation or correspondence: knowing is viewing from outside, true knowing is theoretical not practical. Cognitive theory continues to identify knowing with practices of abstraction, such as classification, computing, calculation, logical inference. Our ability to interact approprately with objects depends on the capacity, fundamental of human beings, for categorizing objects and storing information about them, thus forming concepts, and on the capacity to associate concepts with names. All apprehension of objective reality is mediated through subjective existence, ideas forever interpose themselves between the knower and the, objects which he would know. In cultural psychology the representations are primary, they are situated in social practices rather than in mental models. But what then do these representations re-present? In social constructivism the realm of socially constructed imposes itself between us and nature and through which we cannot reach the world itself. For constructivists it is not material world itself what conveys meanings, but the language system or whatever system we are using to represent concepts. Social actors use conceptual systems of their culture and the linguistic and other representational systems to construct meanings and make the world meaningful and to communicate world meaningfully to others. Culture is about shared meanings. Meanings can be shared through our common access to language. Culture emerges from nature as the symbolic representation of the latter. He suggest that we need to find a place in our theories for the existence of both meaning and mediation before and beyond the realm of representations and symbols, and take their materiality much more seriously. Mediation is taking place in the world and is changing the world, constituting objects not constituted before. We are planning a workshop on collaborative video-usage in e-learning 4.-5.02.2008 in Tallinn. The idea is to test in teams some software tools of video-making and mobile cell-phone cameras. GROUP 1: Group-making and introducing the members, scenarios in face-to-face and online conditions using the video tools. GROUP 2: Collaborative compilation of project materials, scenarios in face-to-face and online conditions using the video tools. Group 3: Presentation and evaluation of projects, scenarios in face-to-face and online conditions using the video tools. We plan around 20 face-to-face participants and in order to test how can collaborative videos be used in distant situations, the workshop is organized so that the remote participants can be part of the groups via Skype connection. Certainly, this is more like a design session and many things may eventually not work, but the participation is free. In Estonian you can read and see some more from Priit’s weblog. A draft of my major ideas. The basic ideas in Activity theory (Leontjev, 1975) relate ‘people who want to reach some goals’ with their ‘mediating tools for realising activities’ necessary to ‘reach the goal’. Mediating tools can be cognitive (eg. language, gestures, content of narrative artifacts or pictures etc.) or material artifacts (tools, objects etc.). Discoveries in cognitive and neuroscience about the functioning of mirror-neuron systems (Gallese et al., 1996), claim, that cognition is embodied through grounding knowledge directly in sensory-motor experiences without the mediation of symbolic representations (Pecher & Zwaan, 2005). From observation of others and the environment (Rizzolatti et al., 2001), from listening narratives (Rizzolatti & Arbib, 1998; Iaccoboni, 2005) or from reading narratives (Scorolli & Borghi, 2007) and looking everyday images of objects or works of art (Gallese & Freedberg, 2007) we perceptually activate certain multi-modal action-potentialites to mediate our purposeful and goal-directed actions (see Gallese & Lakoff, 2005). These embodied dimensions are activations of neural representations located in sensory-motor areas in brain. Hommel (2003) assumes that action control to all behavioral acts is ecologically delegated to the environment – when planning actions in terms of anticipated goals, the sensory-motor assemblies needed to reach the goal are simultaneously selectively activated in the environment, and bind together into a coherent whole that serves as an action-plan, facilitating the execution of the goal-directed actions through the interaction between the environment and its embodied sensory-motor activations. My understanding of affordances sees them as the emergent constraints in the activity system dependent of various system components and interactions. I interpret them as action potentialities. However, affordances can also be potentially embedded into mediating tools due to cultural use of language or due to culturally defined activity potentials objectified in artifacts and tools. Hybrid ecology binds together into one inseparable whole the subjects aiming to do something, the surrounding environment with its objects, and the mediating tools of their action. In this view all external entities of the person can be considered as an environment (eg. living and nonliving things and their causal and structural interrelations). In this symbiosis we can see that in any activity there is no clear and distinct border between subject and the environment. The mediation between the personal (internal) and environment (external) is a dynamic two way process of embodiment of environment’s dimensions, and expressing the embodied in the environment. Any action can be taken only on the basis of embodied dimensions of the environment. Environment becomes a place for action if we accommodate it with our tools, if we embed part of our embodied sensory-motor experiences to the external environment and if we reuse it constantly matching our internal embodied sensory-motor action potentialities and action potentialities that couple with it around us. To be purposely navigating and acting in the environment, persons need to embody part of the environment in order to toolisize it, and start using it for their action. This is not necessarily a conscious and goal-driven process. Also the environment with its culturally defined action potentialities in relation to persons’ previously embodied action-potentials and emotions can evoke certain goals for action. In such case certain aspects of the environment may be extended above the others to the range of the persons’ perception. People can also toolisize the environment by externalizing their internal imaginations, emotions and sensory-motor action patterns to the environment as objects for use for themselves and the others.In a way it can be seen as making the environment as part of their symbiotic being where they can find and use the common sensory-motor action potentialities over and over again. Toolization is not necessarily merely a process of symbolizing meanings. If toolization of the environment is done by language, or making narrative or visual artifacts it is done by using symbols as carriers of sensory-motor action potentialities. But toolization is also direct activity carried out in the environment, when the objects of the environment and some perspectives of the environment are actualized to express and carry out goals-directed action plan, which has sensory-motor neural correlates. Our usual acting in the personally accommodated environment is based on the preferred perception of affordances that match with our sensory-motor action correlates of previously embodied emotions and actions. Basically we repeat ourselves to feel safe in the environment. We actualize the affordances that we define for ourselves as the members of certain culture, those that enable us to take active part in this culture. However, some of the affordances, that are very distinct from the usual affordances, may also be perceived and may start intruding the activation of embodied sensory-motor paths. These affordances can be viewed as the noise to be ignored or noise to be considered. Some of the noise we try to ignore, telling to ourselves that it is the similar affordance to some other usual affordance. Similar affordances are coupled with the previously anticipated sensory-motor action potentialities. Some of the noise we perceive as analogical affordances. Analogy is accepting the difference in nature but making the relation on the basis of some features. In this case partial coupling of anticipated affordances with the actualized affordances happens, which may activate only part of the previously embodied sensory-motor neural correlates or even some new ones. Looking for the noise to activate different sensory-motor experiences is an important aspect of our creativity. Looking for the noise may lead us toolizising the environment for us differently. We basically create new tools to accommodate ourselves into the environment with our usual goal-directed plans. Or, the creation of these new embodiments from the environment would lead us to the totally new set of goal-directed action plans. We shift from one set of anticipated affordances we are looking for in the environment to another set. Lev Manovitch has pointed out to some trends of tool designs in modern environment. Manovitch deals with ‘interfaces’ enclused to ‘objects’. There is a new trend in design: disappearance of technological objects as such, which become integrated into our spaces. In such cases the previous culturally accommodated tool or artifact and the previously culturally accommodated technological interface may together start triggering different potential affordances for action. The action potentials technology offers through ‘interfaces’, and the action potentials that the objects had in another previous culture, can be contraversial and may cause certain “battles” between what action to carry out, evoking the necessity for internal grounding between the different sets of affordances. This would result in not using these new devices most effectively as planned by the designers and visioners of new technology, because we would be triggered simultaneously by the affordances evoked by two different cultures. Basically what we need, is immersion of cultures, becoming these new ‘immersive technology generations’ and we will no more distinguish the potential affordances the objects evoke as old and new activity potentials. Rather we will shift out internal immersed and augmented intentions into the environment activating combined affordances. Do we need new designs to obtain the new culture or would the new culture emerge in using currently not ideally integrated technologically enriched objects and augmented reality? If so we will just start evoking different affordances in this environment and the design and immersion of old and new should not necessarily be melted to each other organically, we would do it by ourselves, with our perception and imagination. In this case we can act in the current environment we are used to, but we can see, if we want so, in this environment also this virtual, technologically added space – we will get hybrid, augmented or ecologically defined environment for totally new activities, where we can go or not go depending our intentions. Manovitch assumed that another trend in design is that tools are vanishing and becoming into seamless interfaces. It seems that in interaction with new technological and hybrid tools affordances of the activity-side become stronger and stronger perceived, while the affordances of the previously recognized tool or artifact sides, where interface is embedded, are decreasing in the perception of the user. In the PhD thesis of Elza Dunkels “Bridging the Distance: Children’s strategies on the Internet” (2007) she conducted online interviews in chatroom to ask about how children perceive the Internet environment. She wrote: From 8000 words in the interviews kids actually mentioned the word computed 19 times, and only at 2 occasions this was initiated by the child. Communication and fun themes, rather the use of technology per se prevailed.Kids totally forgot that technology is there as a mediation tool of their action goals! To interpret these results, it seems that the actualized affordances of Internet seemed not to depend of the objects, computers, technology with its functionalities and limitations, but instead these ‘information age immersed kids’ had real life and very warm and alive activity goals and thus they perceived in the technology environment other affordances than the grownups from earlier generations. Kids actualized for themselves the ‘communication and interaction affordances’ and did not consciously actualize the affordances of the technology as something that mediates their actions. Interesting perspective emerges if the person, who externalized the embodied sensory-motor action potentialites (basically their tools as mediation devices) for themselves to the environment, is viewed from aside by another person. For the other person two versions of the environment may appear. One is where he can see the other subject together with its mediation devices. The studies of embodied cognition indicate that it is highly likely to embody and directly activate the sensory-motor patterns they view the others doing in the environment – thus what is happening is the culturally defined selective embodiment of the action-potentialities (tools they make from the environment to use it)of the others. Evolutionary, this can be viewed as some kind of reuse or optimization strategy, getting the same result without using the energy what was initially used on creating the initial interrelation between the person and the natural environment. 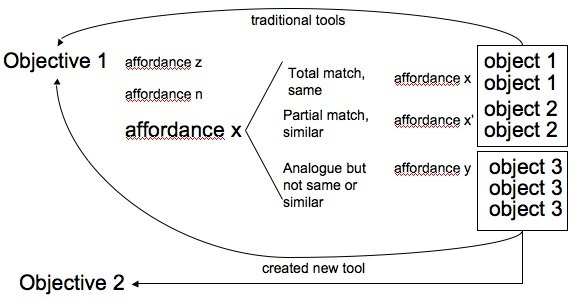 Vyas and Dix (2007) suggest that sets of affordances exits at the level of person, group/community and culture, and that the interactions between these affordances may influence each other. Second is if only these man-made objects (various cultural tools eg. texts, patterns, images, artcrafts etc.) and other type of traces of their activity are left to the natural environment, but their initial originators have left the scene. Now, it is the question of culture to couple the previously experienced sensory-motor action potentialities with those that are recognized in the environment. It is highly likely that this kind of embodiment and toolization of the environment for purposeful action is always partial or even completely transforming the initial action-potentialities of the tools. The notion of meanings in activity-centered view to hybrid ecology needs to be elaborated. Meaning is the result of embodiment of environmental entities partially as sensory-motor action potentialities. Meaning-making is a more or less conscious search of action-potentialities in the environment that can be coupled with previously embodied ones in the process of making them mediating tools. What is meaning making for an individual in these situations when he/she can see only the environment toolisized by someone else? First is, when does the person notice that the environment is actually toolisized – perhaps this is a culturally defied process of noticing certain affordances, coupling it with embodied affordances and taking action if there is a match of affordances. Noticing affordances and actualizing something from the environment as tools similarly as other people depends of whether they are part of this community and culture. It can be assumed that cultures leave traces of activity potentials as patterns to the environment which can be actualized if the pattern is strong enough, frequent enough and matches with some of the anticipated affordances for the person. It is clear that if these patterns are left to the environment without perceived interrelation with their creators, they are harder to be actualized similar way by other people. The previous aspects of hybrid ecology are quite general and deal with the nature of individuals acting in an environment. What happens if the environment too becomes hybrid? Recent trends in the Web development have caused the immersion of borders between the real and virtual spaces, giving rise into the new potential learning environment. New kind of social software eg. 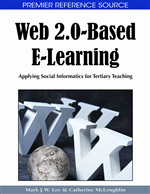 blogs, wikis, social bookmarking services, social artifact repositories enable user integration into democratic content-development and publishing. Mashup technologies allow publishers to syndicate their data into machine-readable RSS feeds to which readers can selectively subscribe with free social software. Geotagging systems make it possible to create locative content by mobile devices, situated both in real and virtual environment (Tuters & Varnelis, 2006). Locative content is digital media applied to real places, any kind of link to additional information set up in space together with the information that a specific place supplies, which is triggering real social interactions with a place and with technology (Tuters & Varnelis, 2006; Hanzl, 2007, Kaipainen & Pata, 2007). 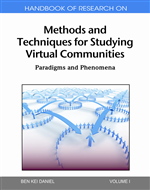 This new learning environment – an augmented reality/virtuality – consists of distributed virtual spaces generated by social software tools, and of the real spaces and objects, in which locative content has been added with mobile devices. Augmented reality, the reality overlaid with virtual reality, and virtual reality, in which representations of the real world have been embedded and contextualised, is enabling interactions both in real and virtual spaces. Lonsing (2004) suggests that an augmented reality system generates a composite view in real time – a combination of a real scene viewed by a user and a virtual scene generated by a computer, where the real scene is submerged with additional information in order to enhance the perception of the user. Rich layers of embodied knowledge and practice in the real spaces, and authentic context triggering activities and knowledge-building in virtual spaces, makes augmented space into a potential learning environment with new challenges for the learners. This new learning medium is a distributed activity space in which learners meet other learners, knowledge artifacts and practices. New augmented learning environment provides novel tools and triggers new types of activity patterns in this distributed space. Possible learning patterns involve both actions in real and virtual spaces – thus we need to view this space as one whole. Space with dynamically embedded meanings (eg. spoken narratives, movement) entails action potentials. The embodiment of these action potentials is a process of coupling affordances evoked by internal imagination and goals in one hand, and the perceived and culturally predefined external affordances from the environment, on the other hand. As a result, this space becomes into a place for new interpretors and starts triggering activities. Question is of course when can persons in such places perceive the patterns of activities, when can they perceive affordances of the certain culture to interact with this culture? In which areas of the augmented reality (real or virtual) can the activity potentials be actualized, will the proceeding activity take place in the same dimensionality or can it cross the imaginary border of these spacial dimensions of the augmented reality? It went well with grants! We finally heard about our special funding from the government – it was accepted! So, 2008-2013 we are going to realize the grant “Distributed learning environments, their interoperability, and models of application”. We will investigate activity patterns in distributed systems, develop the learning environment design model for distributed systems and launch the prototype that consists of inter-operable sets of social software. 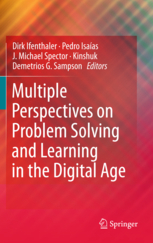 Another great news is that also our smaller grant “Supporting self-directed learning in augmented reality learning environment” was successful for 2008-2011. I think it is a sign that our team in Tallinn University Center of Educational Technology is really good, since the competition was really high and many good teams got less money or were rejected. Today i found a paper, which partially comes close to some ideas about tools, affordances and embodiment as some ecological system. Some ideas or formulations i don’t support 100 % (eg. artifacts have affordances perceived by the user who acts with them) and these seem to be not in accordance with the way they explain the dynamic and mutually influencing and emergent nature of affordances. Maybe it is the question of formulation rather than the step back. There notion of embodiment is not based on new ideas from neural findings. Material artifacts related with practices play a critical role in the activity formation. Authors introduce the notion of artifact ecologies, which refer to a system of consisting digital and physical artifacts, people, their work practices and values, and lays emphasis on the role artifacts play in embodiment, work coordination and supporting remote awareness. 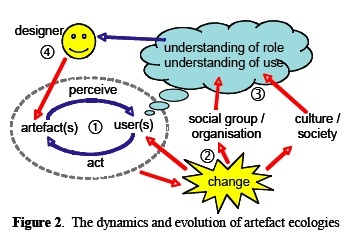 Artifacts have affordances perceived by the user(s) who then act on them. However, performing action changes the situation culturally, cognitively, physically (eg. user’s awareness of affordances increases when using an artifact). This leads to reflection on the potential uses of artifacts and people’s roles (constraints on action). Once the users are aware, their perceived affordances change. They distinguish 3 levels of affordances: personal, organization/community and culture level, which differ also on the level of how rapidly they can change. Affordances of different levels influence each other. For example affordances one person can perceive may depend on the affordances the community perceives or culture uses as norms. They refer to Ilyenkov (1977), who sees the creation of artifacts and tools as embodying practices of the community, claiming that artifacts embody cultural norms and values. The notion of artifact ecology offers a set of analytical properties of artifacts that emerge from the interaction between participants and artefacts in different situations. Embodiment: Artifacts allow participants to use their bodily skills and their familiarity of the real world objects. At its core, an affordance perspective recognizes that a technological object has some recognized functionality but needs to be recognized as a social object. As a social object, its influence on organizational functioning and performance cannot be separated from expertise, jobs, processes, or structures. Authors raise the question: How do novel combinations of IT and organizational features create new affordances and how affordances impact on organizations’ boundaries. The article is from the special issue dealing the interrelations of technology and industries. Zammuto, RE, Griffith, TL, et al. Organizing no longer needs to take place around hierarchy and the collection, storage, and distribution of information as was the case with “command and control” bureaucracies in the past. The adoption of innovations in information technology and organizational practices since the 1990s now make it possible to organize around what can be done with information. These changes are not the result of information technologies per se, but of the combination of their features with organizational arrangements and practices that support their use. Earlier theories:Common to these models is the underlying premise that the structural forms of organization (e.g., functional, divisional, matrix) are defined by hierarchies because they specify authority relationships, determine information flows, and serve as the primary mechanism for the coordination and control of activities. Hierarchy was the original thread from which the fabric of organization was woven. * Increasing technological complexity requires greater structural complexity for effective performance (Woodward, 1958,1965). Woodward, J. 1958. Management and Technology. H. M. S. O., London, UK. Woodward, J. 1965. Industrial Organization” Theory and Practice. Oxford University Press, New York. *The number of exceptions in a work flow and the extent to which exceptions were analyzable would impact the location of discretion and power within an organization, the interdependence of work groups, and how they were coordinated (Perrow, 1967, 1970). Perrow, C. 1967. A framework for the comparative analysis of organizations. Amer. Sociol. Rev. 32 194–208. Perrow, C. 1970. 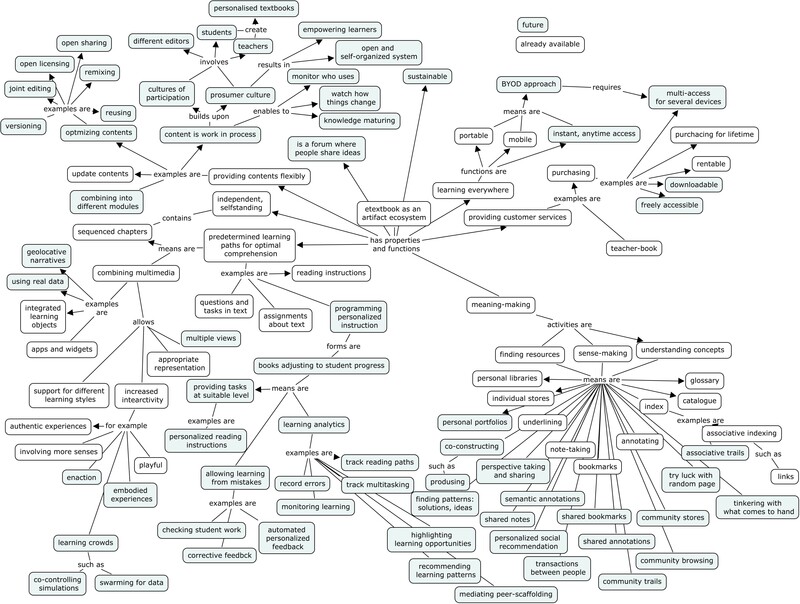 Organizational Analysis: A Sociological View. Wadsworth, Belmont, CA. * Decision-making uncertainty could be reduced by decreasing the amount of information required through the provision of slack resources, by buffering, or by increasing an organization’s capacity to process information. Increasing information capacity could be accomplished using formal hierarchical information processes and through lateral integrating mechanisms. Galbraith (1973, 1977) saw information technology as a tool to enhance vertical information processing whereas horizontal information processing could be increased by creating linkages between people who possessed part of the information required for a specific decision-making activity. Galbraith, J. 1973. Designing Complex Organizations. Addison-Wesley, Reading, MA. Galbraith, J. R. 1977. Organization Design. Addison-Wesley, Reading,MA. The contingency theory debate about the relative merit of technology versus size and environment as determinants of organizational structure in the 1960s and 1970s. Institutional theory (Meyer and Rowan 1977), population ecology (Hannan and Freeman, 1977), and resource dependence theory (Pfeffer and Salancik 1978). By the mid-1990s, technology had virtually died out as a theme in the study of organizational form and function within the organization science literature. Technology’s relationship to organizational form and function. 1996-2005 13 articles examined the relationship between IT and organizational phenomena such as communications, teams, learning, the nature of work, and interorganizational relations. of everyday life and the world of organizations increased dramatically. communication. Automation within organizational functions meant that routine information collection and storage tasks were taken over by IT, replacing paper and people with electrons, without fundamentally changing the way work was done. Managers relied on upward flows of information to surface problems with the ongoing operations and downward flows of instructions for making adjustments. Zuboff’s (1988) seminal research demonstrated, automation increased managers’ sense of certainty and control over both production and organizational functions, thereby reinforcing hierarchy. *Productivity paradox suggested that information technology was not significantly affecting organizational form and function as reflected by outcomes. In 1990s research began to report a positive relationship between IT investment and productivity in industries and firms. Greater investment in IT is associated with greater productivity growth (Dedrick et al., 2003). IT as enabler of organisational changes – the wide range of performance of IT investments among different organizations can be explained by complementary investments in organizational capital such as decentralized decision making systems, job training, and business process redesign. ERP incorporated supply chain management systems during the late 1990s, which allowed integration to occur across organizational boundaries. These systems reduced the need to use hierarchy to manage information flowsand coordinate activities. As a result, these enterprise systems decreased the need to move information through a hierarchy, allowing people to organize around the work itself and what could be done with the information. In addition to automating work, activities, events, and objects are translated into and made visible by information (Zuboff (1988). Opportunities for emergent patterns of interaction or, in other words, new forms of organizing. Everyone could “see” and understand the whole work flow. These communities of practice organize work not through static vertical slices, but through emergent horizontal flows of work around core processes (Brown and Duguid 1991). views of organizational form become incomplete. We try to capture the interplay between IT and organization using the term “affordances” in the sense that new combinations of technology and organizational features continually create possibilities that affect organizational form and function. Affordances are the result of the confluence or intertwining of IT and organizational features. Using an affordance lens suggests that although IT and organization features may exist independently of each other, their value for explaining organizational form and function comes from how they are enacted together. We describe five possible affordances—1) visualizing entire work processes, 2) real-time/flexible product and service innovation, 3) virtual collaboration, 4) mass collaboration, and 5) simulation/synthetic reality. 1. Visualizing entire work processes affordance is the ability to observe the entire work process in action from “end to end,” representing it through language, imagery, or physical artifacts to make decisions about next steps when alternative actions can be taken. This affordance is enabled by the symbiosis of technology and organizational features. Visualization enables the collective sensemaking. This affordance makes the organizing process emergent and mutable.This affordance can make organizational boundaries more permeable yet able to be monitored. 2. Real-Time/Flexible Product and Service Creation affordance is the ability to create software-enhanced products and services by quickly recombining components in new and innovative ways. Several enabling technology features make possible the integration of components in innovative ways including web-based service-oriented architectures, standardized component designs, and open source software.Creation of a “common ground” of social action that enables people from diverse backgrounds and expertise to come together easily is needed to trigger this affordance. Transactive memory systems is one example of shared understanding that must be able to allow for emergent cognitive structures as problem definitions and solutions dynamically evolve (Lewis et al. 2005, Majchrzak et al. 2007). Structures are needed to facilitate crossing thought world boundaries such as boundary objects that accommodate the kinds of knowledge being codeveloped among the groups (Carlile 2004), and boundary spanners of varying types to gather up information, scout out opportunities, or ward off unnecessary interference (Ancona and Caldwell 1992). These roles, coupled with help from intermediaries such as brokers, opportunity recognizers, and translators (Markus et al. 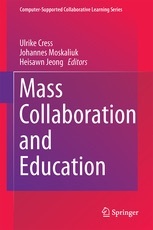 2002, Majchrzak et al. 2004), facilitate more creative mixing of the components. 3. 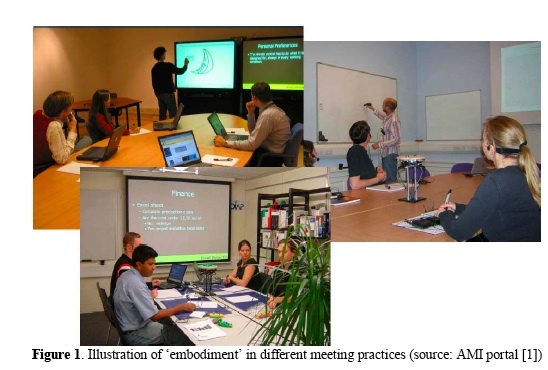 Collaborating virtually affordance refers to the ability to share and integrate others’ knowledge when that knowledge is primarily conveyed through virtual media. Virtual collaboration can broaden participation in an organization’s work processes and decision making by including people located at its periphery.Virtual collaboration increases the potential for bringing people from different organizations and disciplines together dynamically for short periods of time.Virtual collaboration provides the opportunity to capture decision rationales and work processes as work is done, enabling future actors to reuse or learn from past work. Virtual collaboration enhances the potential for organizations to extend their boundaries. 4. The mass collaboration affordance is defined as the process by which people interact on a many-to-many basis via the Internet as opposed to a one-to-one basis (e.g., instant messaging), or a one-to-many basis (e.g., list servers) creating new unexpected content. Maintaining norms of reciprocity are critical (this is in accordance with Nonaka’s ideas of managing ba!). A major implication of the mass collaboration affordance (like using wikis in organisation) for organizing is that it creates the potential for quickly developing temporary organizations.It affords the possibility of unbounded networks. 5. The simulation/synthetic representation affordance is defined as the capability to conduct what-if scenarios.Simulation can affect how people actually go about their work by giving them multiple simultaneous personas to play, e.g., a person may play an avatar at Toyota and a real marketing person at Toyota. You are currently browsing the Taming the spaces blog archives for January, 2008.